Six Miamians have been offered 2019-2020 Fulbright U.S. Student Program grants. In addition, faculty member Tani Sebro has been offered a Fulbright Scholar award to study migrants returning to Myanmar from Thailand. She's pictured here doing interviews in a refugee camp in Thailand in 2017. Six of Miami University’s Fulbright semifinalists have been offered 2019-2020 grants and another has been named an alternate. In addition, Tani Sebro, an assistant professor in Global & Intercultural Studies, has been offered a Fulbright Scholar award through the ASEAN Research Program to study migrants returning to Myanmar from Thailand. Fulbright, the largest U.S. exchange program, provides grants for individually designed study/research projects or for English teaching assistant programs outside of the United States. Since 2000, 51 Miami students and alumni — not including these latest offerees — have received Fulbright U.S. Student Program grants to conduct research or teach overseas, according to Karla Guinigundo, director of global partnerships in Miami’s Office of Global Initiatives. 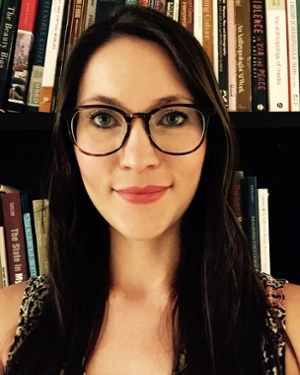 Alexandra Fair, a graduate student in history, has been awarded a Fulbright/University of Reading Award to pursue graduate work in the United Kingdom. She is Miami’s first research/study award winner since 2010. UK partnership awards are notoriously difficult to get, Guinigundo noted. Sarah Berg — senior, English literature major with minors in art/architecture history, creative writing and Asian/Asian-American studies, English teaching assistant in South Korea. Madison Cook — senior, diplomacy and global politics and psychology double major, English teaching assistant in Ecuador. Emily Erdmann — senior, French and Russian, East European, and Eurasian Studies double major and rhetoric/writing minor, English teaching assistant in Russia. Cyrus Green — graduated in 2018, international studies major with Spanish minor, English teaching assistant in Argentina. Lauren Voegtle — senior, international studies and Latin American, Latino/a, and Caribbean studies double major, English teaching assistant in Brazil. Jessica Weaver — senior, integrated social studies education major, is an alternate to be an English teaching assistant in Belgium. Jane Winsett — graduated in 2017, international studies and women's, gender, and sexuality studies double major with Spanish minor, English teaching assistant in Kosovo. More than 10,000 applications were received in this cycle for the 1,900 available grants. Miami had 28 applicants, who applied to 20 countries this year. Fourteen were named semifinalists in late January. Visit Miami's Fulbright page to find more information about the program.